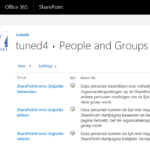 One of the missing features in Office 365 is the possibility to schedule SharePoint Workflows. This was one of the many features Nintex offered in their Workflow for SharePoint Product, which is not available in Office 365, yet. So I was looking for other solutions to this common problem. There is already tooling on the market for exactly this scenario, but well they cost and you are dependent on the vendor. And then I remembered that Microsoft just introduced Azure Logic Apps: Workflows in Azure. This just seemed to bring the solution my problem. 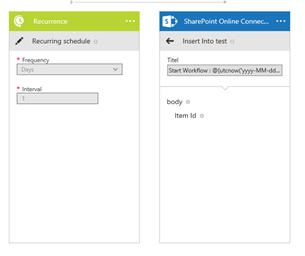 By using the SharePoint Online Connector you can insert an item into a list. And let that trigger a regular List Workflow. This List Workflow can then fulfil the logic, or it can trigger a Site Workflow. By adding a recurrence trigger to your Logic App, you can configure it to run daily. You can also use functions within the actions, like I used the current date as the title of the list item to be created.